Today I am sharing some photos of our Elizabeth. We are completely head over heals for her as you probably can tell. Her hair is just gorgeous....and her pin curls in-tact. Her face is just lovely, we love her bright, crystal blue eyes and the fact that she has her ears pierced. She is the only doll that we have that has her ears pierced. Here is a picture of Elizabeth in her underclothes. We are using that as her nightgown right now since we don't have anything from her period yet that would work for a nightgown but we were looking and found this really nice set here. For now though, her under garment is working nicely. Here she is in her "meet" dress. Zoey just loves it! It's the first long, period gown that she has. It's shimmery fabric and almost iridescent when it hits the light different ways. It's really in good shape too which is nice. All of the little details on the dress just amaze me. We are so tickled with this "fancy" dress. Here is a close-up of Elizabeth's earrings. We didn't get her accessories...it would be fun to get her dangly earrings sometime if we can find them, along with her little headpiece. I'm not sure what else it is that she had for accessories, I'll have to research that. Here is a close-up of her pretty shoes. And...something that is interesting to me is comparing Elizabeth to McKenna. I was worried for a bit at first that the two dolls would be too similar but as you can see in the following photos, they really aren't and I needn't have had worried. Here are the two together side by side. The hair is quite different, the eyebrows different and the make-up and lips are different as well. You can really see the hair difference when viewed from the back. Elizabeth's hair is longer and quite a bit brighter than McKenna's and also has a bit of a natural feeling wave to it. Here the girls are facing one another for a side view. We love them both so much! We hope you learned a bit more about Elizabeth Cole! I'm sure you will be seeing her in more pictures here and there since she's fitting right in with the other dolls quite nicely and will be sticking around for sure! My older sister has Felicity (Elizabeth best friend) and I want to get Saige. I am worried that they will look to much alike. what should I do because I really want her? But I want to tell the difference between them.I can't find any reviews or side by side pictures eathier. Will you help me. If Saige is the one you are wanting that is who you should go with for sure!! :) Good luck and let me know what you end up deciding! Thank you! I'm going To Chicogo in may with my girl scout troop and we are going to the American girl doll store. I have almost earned all of the money that I would like to bring. I am pretty shure I am getting Saige now that I see that comparison. So thanks for all the help and I not shure if I said this before but I love you site I go on it every day so keep posting lots and lots of crafts. Thanks so much Katie! You are too kind! 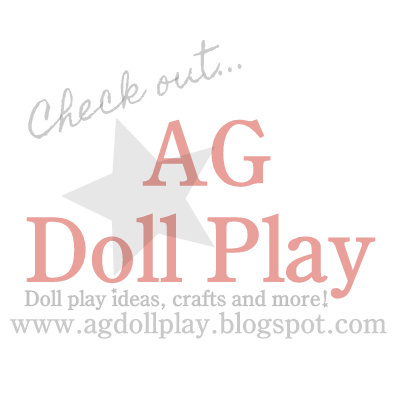 Right now we are working on making a doll salon backdrop for the dolls...hopefully we'll get to share it soon! That sounds really cool I hope you post it soon. I will look forward to seeing it! Your Elizabeth is gorgeous! I have always wanted her :) She is lucky to be in such a fun home! I have had my Elizabeth for almost 5 years! She is still in pretty good shape and I love her sooooo much. I hope you enjoy your Elizabeth as much as I do!